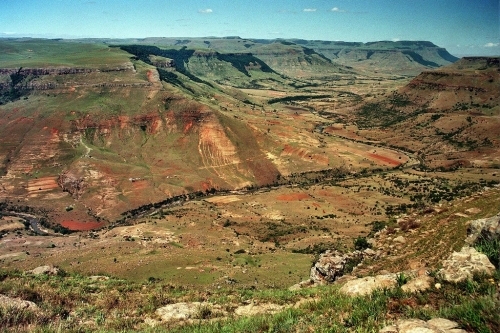 The impressive Xuka River Canyon is 13 km long and 500m deep on average and occupies a large tract of land to the north of Engcobo in the Eastern Cape. In our news release today we explore some of the canyon statistics around the world, not least of which is a new canyon recently (2013) discovered in Greenland under the ice sheet, which is 750 km long, which makes the Grand Canyon look tame. The mountain pass that allows access to the Xuka River Canyon is the ominously named Satansnek and when you watch the video, make a note of the ungated gravel track at 3:19, which leads up to a koppie adorned with telecoms masts. Scoot up there and enjoy the stunning views over the canyon from this vantage point, which most people never get to see. Most of the tarred section of the pass traverses the spine of the mountain and has wide verges, which doesn't allow the best views of the canyon. That's the easy part. The tough part of this pass comes right at the foot of the pass where you have to ride through the frenetically busy streets of Engcobo, dodging pedestrians, cattle, dogs, children, chickens, taxis, cars and deafening music - and where the rules of the road have long been forgotten. The R58 is looking patched and potholed. Watch out for oncoming cars ending up on the wrong side of the road as they attempt to avoid the potholes. This link will take you to our news page and the link to Satansnek. As usual it's free to all Wild Dogs members until Sunday.